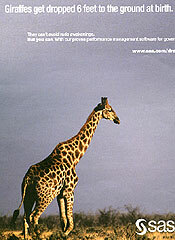 Giraffes show no clear affinity for any single product type. There is perhaps a slight tendency towards cars and printers, but it's difficult to be sure because of the small sample. They are not popular, perhaps even less in the English copywriting world. There is wide agreement about the right approach. 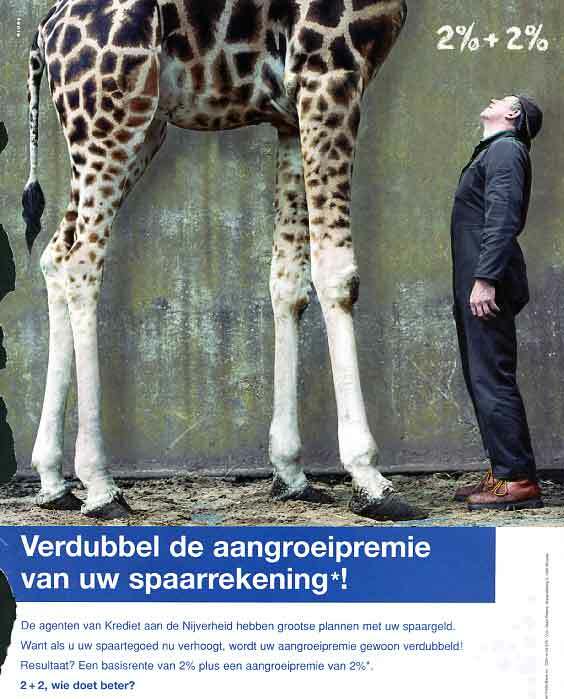 Stick to the facts —Giraffes are high with a long neck— or tickle the funny bone with some mild humor. They are very convenient to flavour an advertisement with a soupçon of exotism. 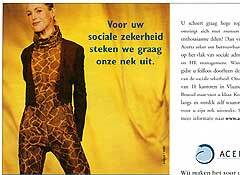 Real Big Color dates from 1996 and though I have material from ten years earlier it is the earliest Giraffe advert in my drawers. Something must have happened in the year 2000 because from then on Giraffes were more en vogue. Several cases each year. 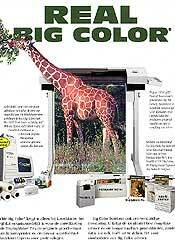 In this advert, although true colour is mentioned, it's the size which is most important and stressed several times. 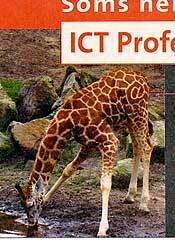 The text ends with You get the highest productivity without the need to stick your neck out . I'm flabbergasted. No need to fold yourself in four. 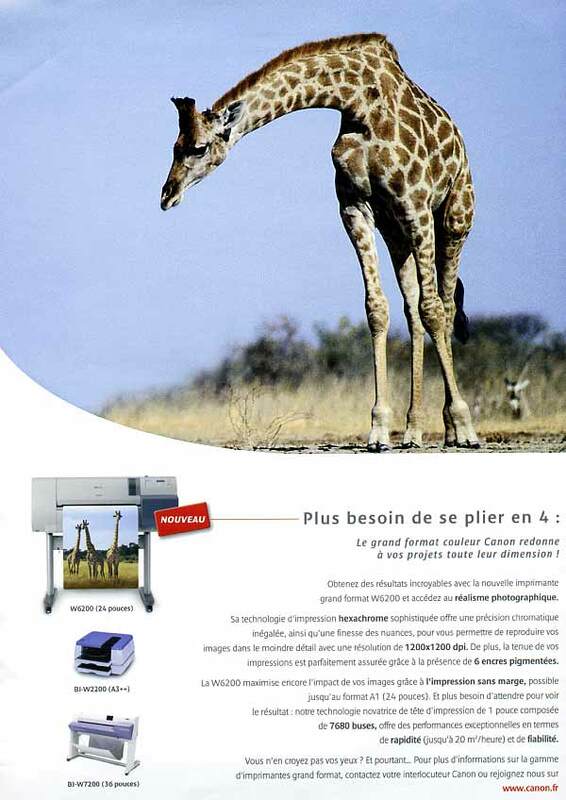 This colour printer (2) dimensions your project to its true size. 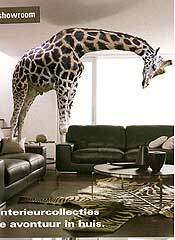 The choice of a giraffe accentuates this sizing aspect. It's therefore a bit unexpected that the remaining text elaborates on the technologie and the colour realism. This is a subject normally trusted to Colourful Fish (See also [Illustration 5]). Look further. 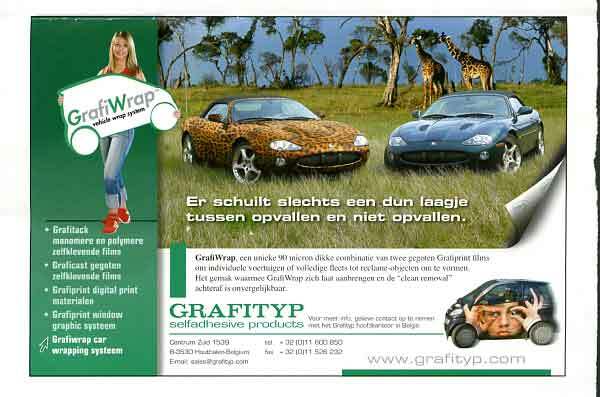 We are your flexible partner for digital printing (3). This writer excels in an approach supported by fact —his advert is the best we have!. 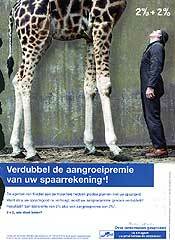 It's possible to look further away from a higher viewpoint and the Giraffe's neck really is very flexible by the peculiar build of the vertebrae. Enhance your home with a bit of adventure (4). The cheesy text mentions adventure, escapism, exotism, simplicity and beauty, humming citylive, love for a modern livestyle and design all in one short paragraph. 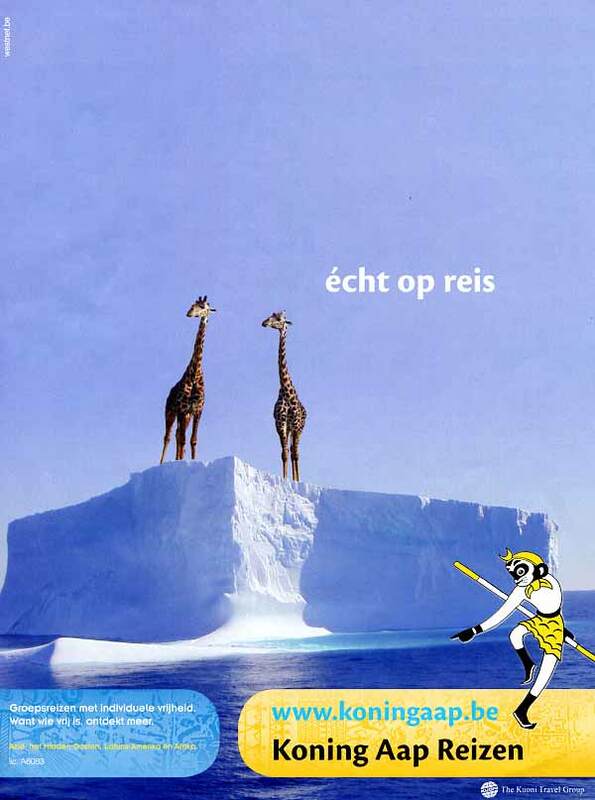 The giraffe is the adventurous sugar on the cake. The ceiling is too low, so he has to lower his head, but I wonder what he's thinking. 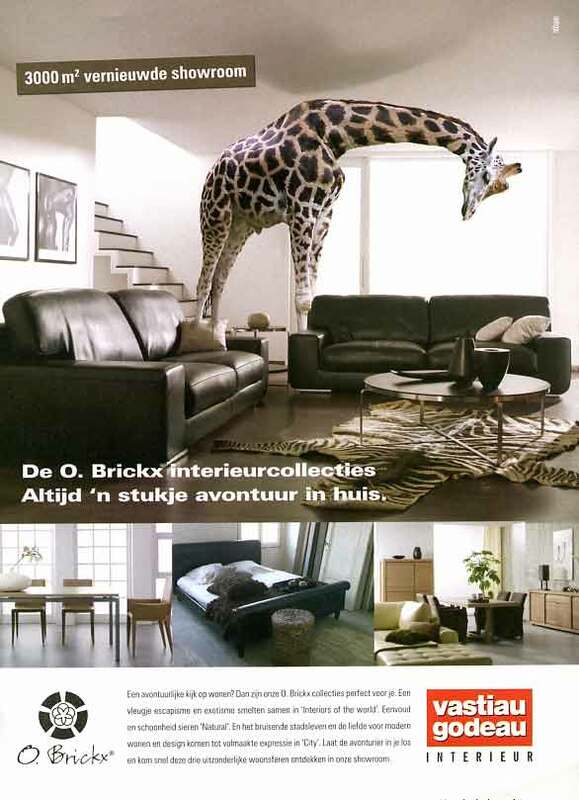 The poor animal must be worried because the floor is covered with a Zebra hide (Read our section about Zebras). 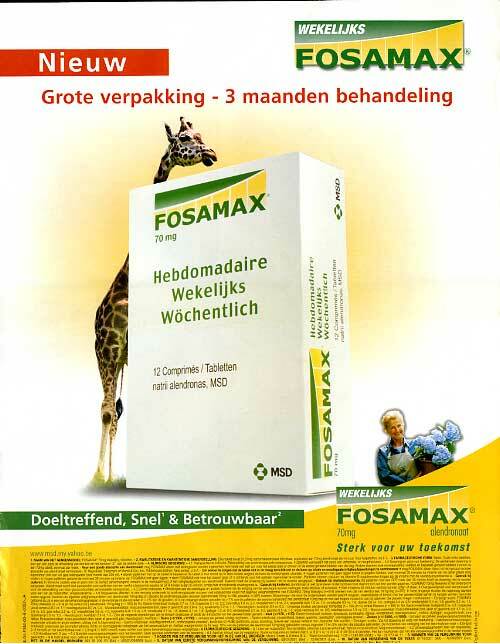 The giant's packet of advert 5 contains 12 tablets of a product curing osteoporosis. If you are equipped with long legs and a heavy neck then solid bone is an important issue. 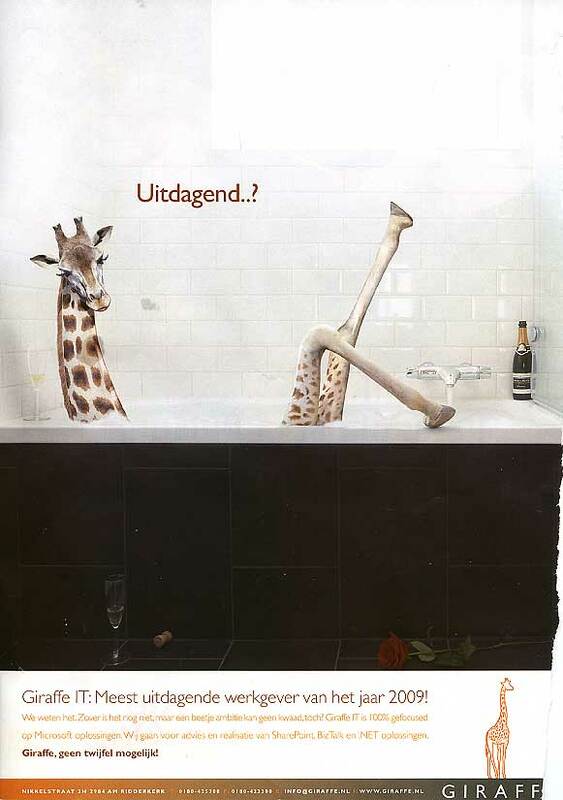 That probably explains the Giraffe. But the smallprint states the importance of a quick arrival of the tablet into the stomach. 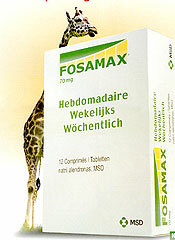 I would therefore rather dissuade a Giraffe from taking this particular drug. Every new installment on your savings account will double your bonus (6). Your money will reach the sky in 1-2-3. Yeah, sure. You do like to reach new heights, don't you? Advert 7 then continues with some fluff and finishes with Visit us and learn why we are glad to stick our neck out for you . It's just a bunch of words without meaning — It's probably written by the son of the boss. 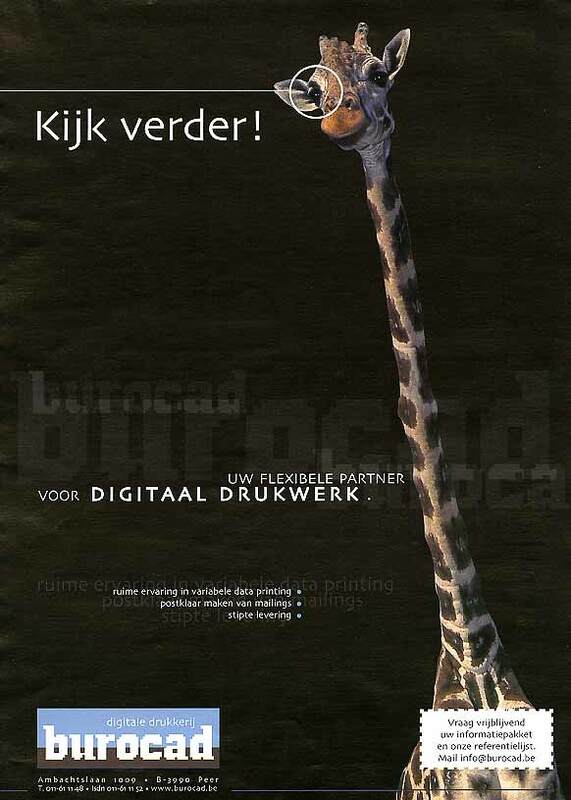 The weak (and twisted) link between their business and a Giraffe is the neck they are willing to stick out. 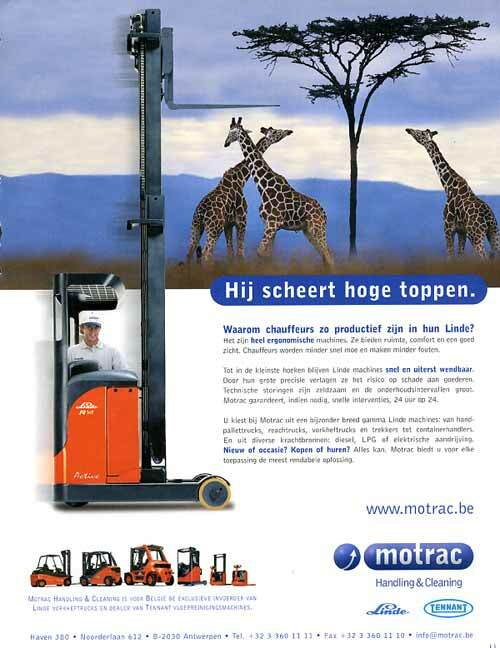 The forklift truck (ad 16) follows the same line of thinking: productivity will reach new heights. 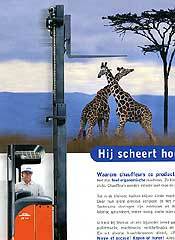 A forklift is used to lift objects up and down and reminds people of a Giraffe's neck. 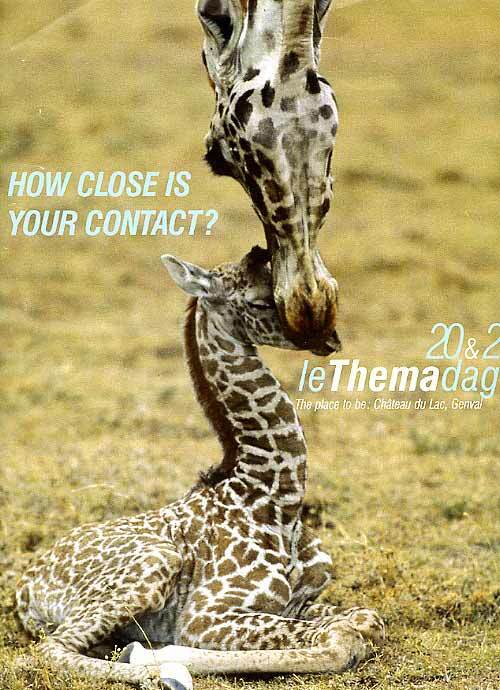 Really away from home (8) is a very common approach and is not in the least restricted to Giraffes. The image combines a dash of exotism with contrast and a drop of humor. It's a strategy often chosen by firms who deliver services instead of goods. Because there is no need of a link relating a feature of a product almost any species would do. The method of choice, however, is to take a species of a tropical habitat and place it in a cold environment (or the reverse). We have examples in several sections: Camels, Penguins, Cats and more. 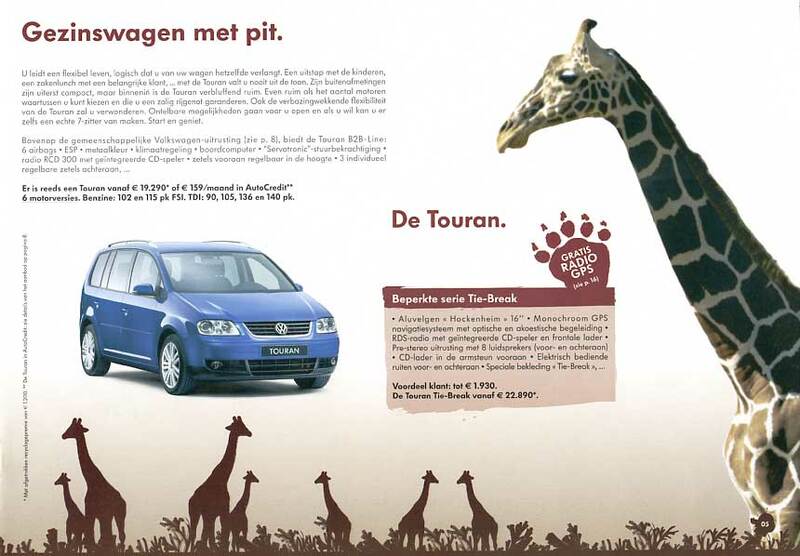 Giraffes are not at their best with cars. But what can you do if you wouldn't want to reach for a Horse, Elephant or Penguin like everyone else? The family car of ad 9 is remarkably spacious and amazingly flexible. 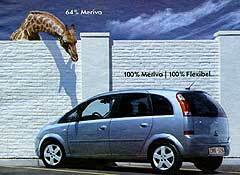 The ad is part of a series where each model is linked with a species: a dog, a penguin (see also Penguins where another brand in 1991 followed the same path), a flamingo, an ostrich, and now a giraffe. They are just ornamental, the copywriter didn't even try to make a connection. 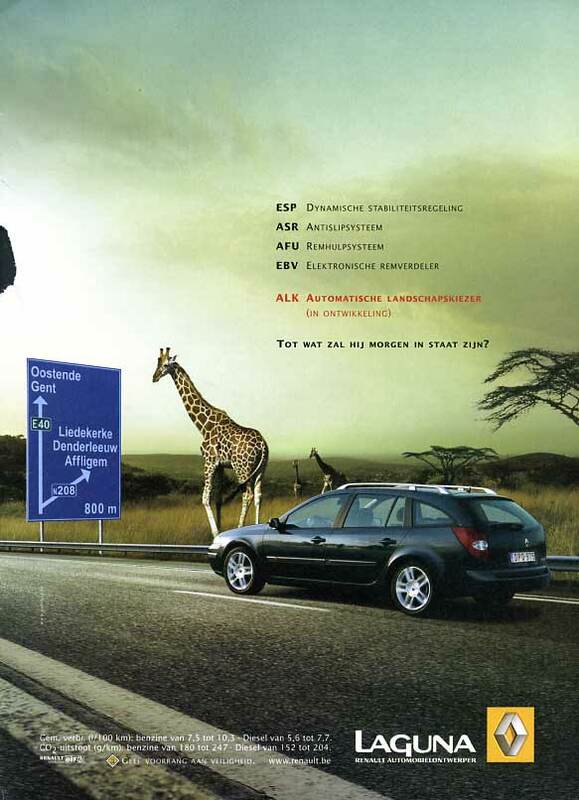 The author of advert 10 at least stressed the fact that there is plenty of leg- and headroom. 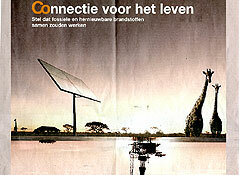 A feature greatly appreciated by a Giraffe. A third car brand goes for a slightly more intelligent approach. Selling a car is often selling a feeling: escape from everyday greyness into adventure without risks. 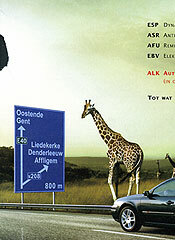 The roadsign shows that we are still in our familiar environment but the Giraffe strikes the explorer in us. There is also a touch of wit. One of the options is an automatic landscape switch (11). 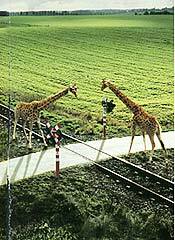 Two Giraffes are garding a railroad crossing (12). 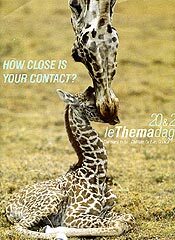 Finally a advertisement where no other species could do better. There is an added twist. The guardians relate to the company's motto that travel by train induces a feeling of adventure. 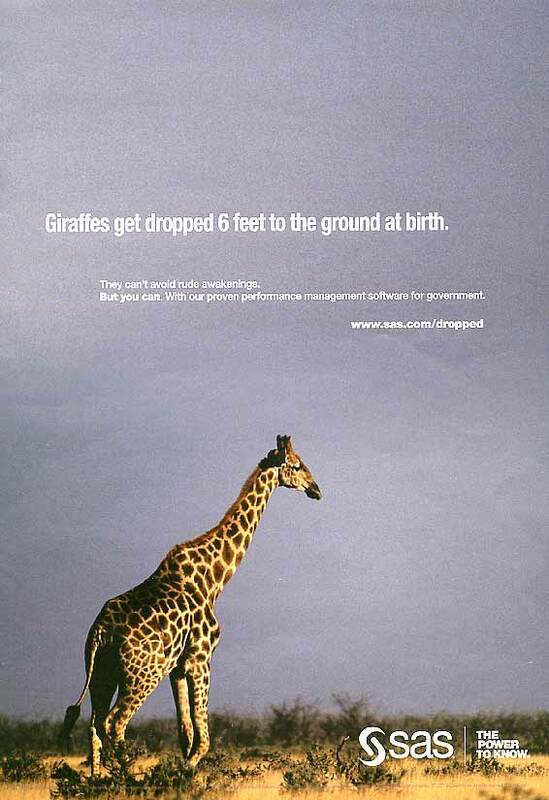 Giraffes get dropped 6 feet to the ground at birth. They can't avoid rude awakenings. But you can. By using the special software that warns before it's too late. This is an original approach completely different of all other advertisements in this chapter. 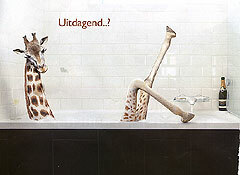 It is based on a fact of behaviour (not a long neck). 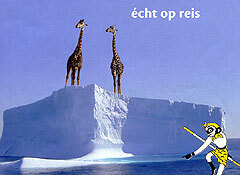 The Giraffe is giving a warning for unpleasant surprises: a task often trusted to Sharks. 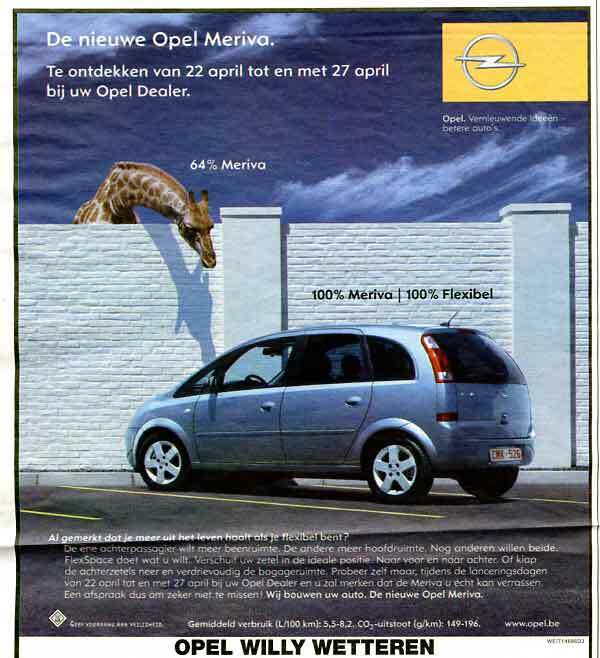 The remaining advertisements have in common that I don't understand why exactly a Giraffe was chosen. Is many a case any other species would be at least even adequate. 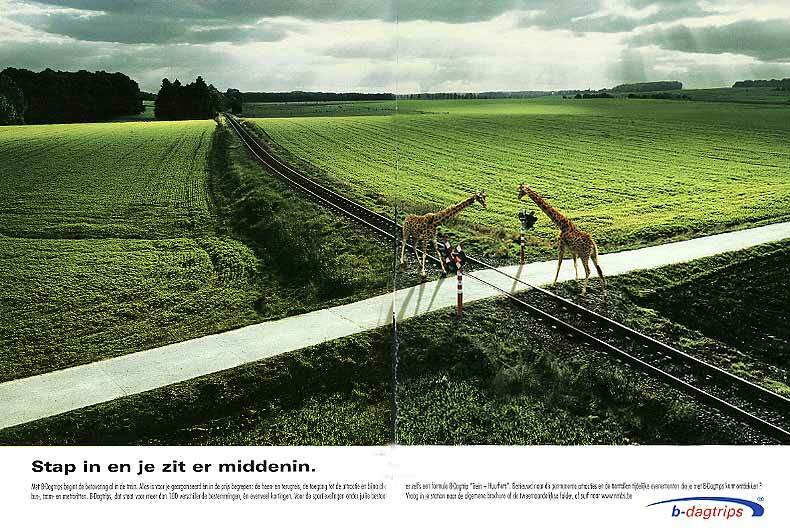 Advert 14 has it right that in the environment shown being conspicuous or not is extremely important. It can save your life or your lunch, it all depends where you belong in the food-chain. Notice the pattern on the car. 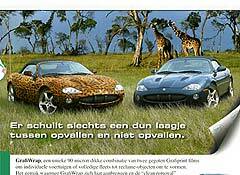 The whole setup complies with the common practice of car adverts: emanate power and a sense of adventure and people will look. Exactly like the giraffes. They are merely onlookers. Any species would do. A Mother with child composition normally means We care where the young represents the reader who will be pampered by the advertiser (e.g. Elephants 14 or Penguin 21). 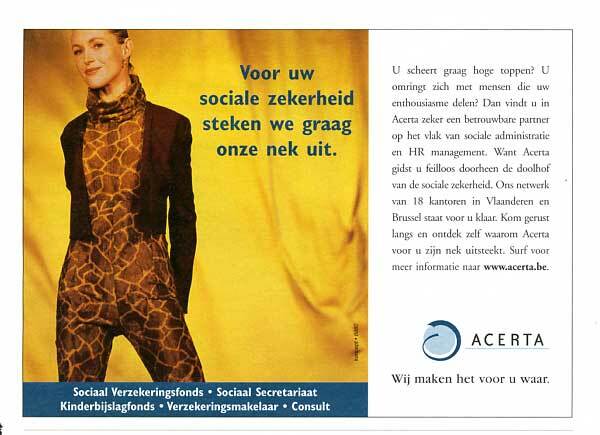 Advert 17 (a marketing association) turns this convention up-side down. It reads: In a world of ruthless competition, only the fittest survive. A close relationship with your clients can make the difference . The reader is the business owner who must look after the customers (the young) for his own survival. But again, every mother with child would do. 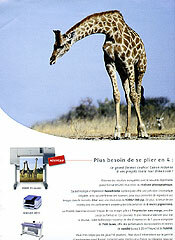 Advert 18 warns against unauthorized copying. A similar message was brought with a Zebra — Much better in my opinion, although I still don't see why they choose this species. Our example at hand consists of two parts (click on advert 18 for a complete picture). 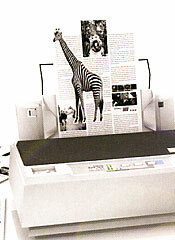 First comes a scanner draped with an original carying a Zebra. 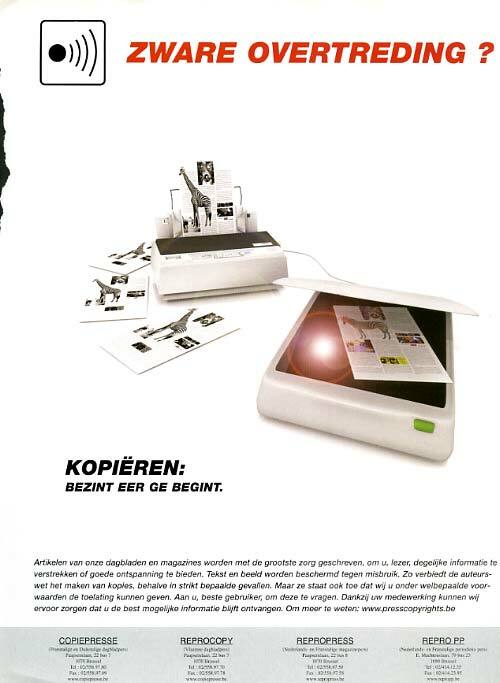 Next to the scanner is a printer spitting sheets. 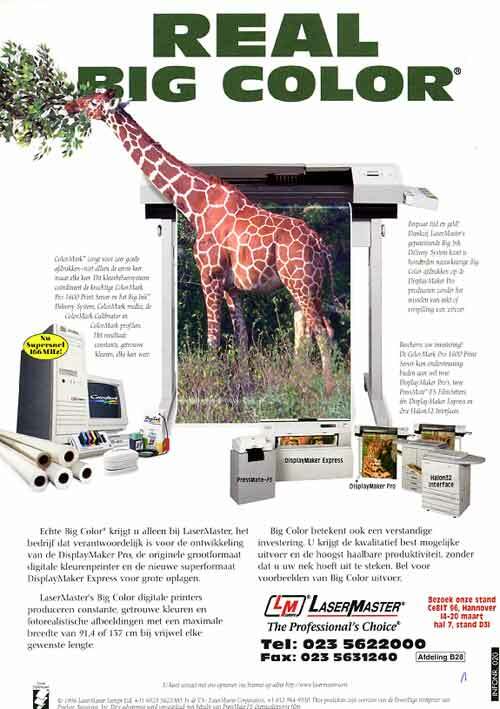 But the copies feature a Giraffe! Are they suggesting that a copy is inferior to the original? 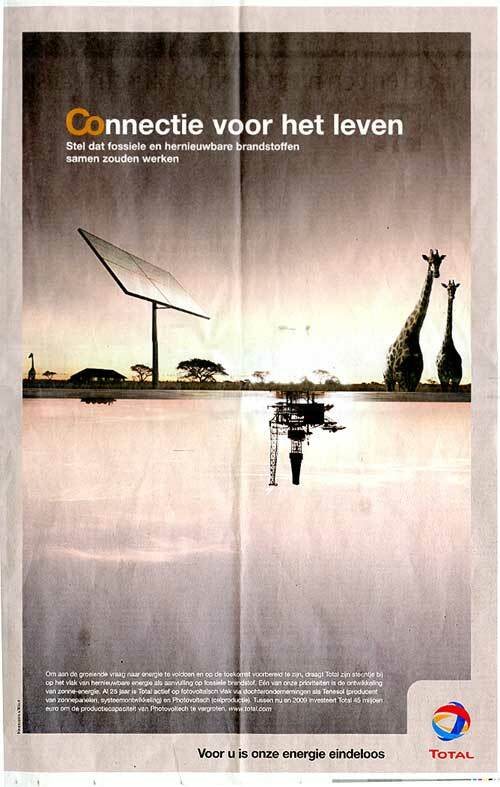 In advertisement 19 the Giraffe relates to the name of the company. 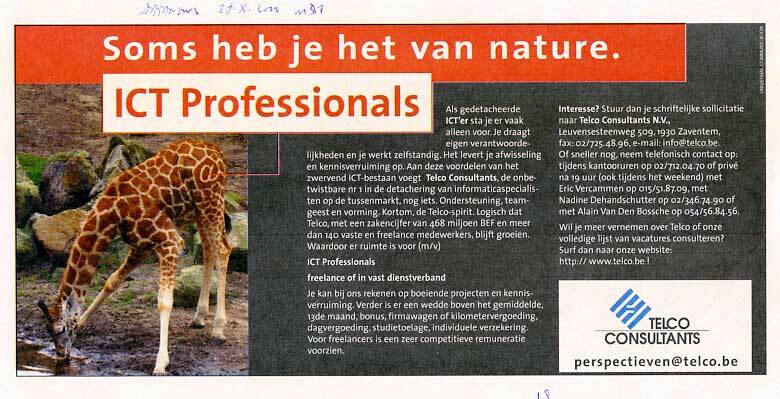 Example (20) is part of a series of similar advertisements for ICT professionals. You can find them in several sections. 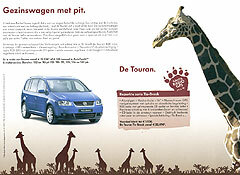 Different species are shown and nothing in the text gives a hint about why that particular animal is called upon.